Centre distance 250mm and 40mm swing. Variable speed control covering 1,000 - 5,000rpm. Turning in miniature is a pleasing hobby. 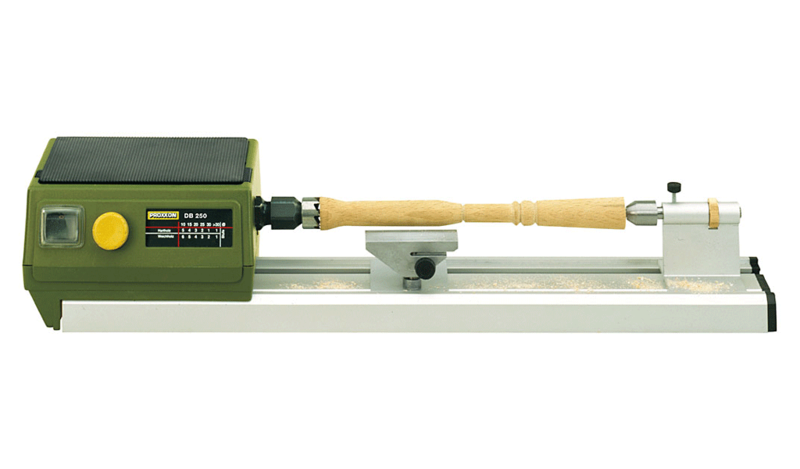 The electronic speed control assists in the lower range in a 'semi-automated' painting process. Work pieces are secured by means of collets (1 each of 2 - 3 - 4 - 6 - 8 and 10mm are included). With individually adjustable jaws. Used to clamp asymmetrical pieces such as rectangles. The reversible jaws clamp from 1.5 - 35mm (inside) and from 14 - 67mm (outside). The DB 250 headstock spindle of thread M16 x 1 screws directly into the chuck. Used for concentric clamping. Made from steel and offering 1.5 to 20mm and 12 to 50mm when reversing the jaws. The chuck has a M16 x 1 thread for fitting directly to the DB 250 headstock spindle. 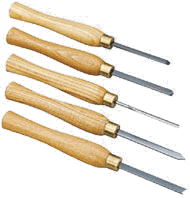 A high quality set with the most frequently used turning tools: gouge, skew, parting tool, beading tool and scraper. Neatly packed in a wooden box. Clamps up to 5mm. Is inserted on the spot of the rotating back centre. The feed movement results from sliding the complete tailstock.